Glassless mirrors on rolling stands, also known as portable dance mirrors are the perfect solution if you do not have the wall space to mount mirrors. 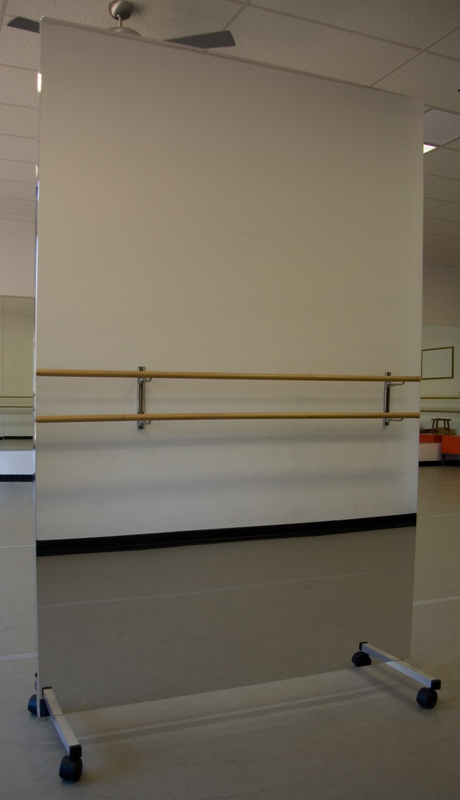 The portable dance mirrors can easily transform one large space into two smaller areas. Our glassless mirrors on stands can either be mounted on stationary stands or rolling stands with wheels. The rolling portable dance mirrors are easy to move into optimal placement and when not required the mirrors can be nested closely together when storage space is limited. Our free-standing portable dance mirrors on stationary stands are light-weight and can be picked up by one person and easily relocated to another area. Glassless mirrors are predrilled and can be mounted either horizontally or vertically on the stands. If you should decide at a later date to mount the mirrors on a wall, this is easily. Just remove the stands and mount the glassless mirror to the wall. Portable dance mirrors on stands are used widely throughout school districts, universities/colleges, community/recreational centers, theatres and dance studios. The glassless mirrors on stationary stands are an excellent and safe replacement for heavy traditional glass mirrors. Many school districts and government agencies have forbidden the use of glass-plate mirrors in public areas due to the safety concerns and risks of shattering glass. The portable dance mirrors are easy to assemble, instructions are included with each order as well as the necessary hardware. Because our glassless mirror film has virtually no mass, the issue of static electricity attracting dust to the mirror surface is practically non-existent. If the portable dance mirrors should get dirty, they can be cleaned by using a regular glass cleaner such as Windex™ and a soft cloth to avoid scratching the surface. If you require any additional information, please email us or phone 1-866-491-9019.